In DuBois, Clearfield County, police are dealing with a major increase in drug arrests over the last year, the majority involving methamphetamine. DuBOIS, Pa. — In a commonplace catering hall in this small town typical of Pennsylvania, a woman sat in a folding chair by a Christmas tree, looking like she wasn’t really there. Every few minutes, her daughter bounded up to the table in her pink hooded sweatshirt, and the woman smiled for a moment while she brushed the little girl’s hair back with her hands. Many among the hundred at this spaghetti and meatballs fund-raiser in Clearfield County wore black shirts with her late husband’s name emblazoned across the back: Officer Patrick Straub, That’s why she didn’t smile much. On Sept. 17, Straub, 33, was killed in a head-on crash in adjacent Jefferson County by a man authorities said had “off the chart” levels of methamphetamine and amphetamine in his system. Officer Patrick Straub,33, was killed in a crash in Jefferson County on Sept. 17. Authorities said the man driving the other vehicle had high levels of methamphetamine and amphetamine in his system. DuBois, a city of 7,500 people about 100 miles northeast of Pittsburgh, has a meth problem, and it’s not alone in rural Pennsylvania. The Pennsylvania Farm Bureau even has a “meth awareness” page on its web site to help farmers who suspect meth labs on their properties. In April, the Pennsylvania Attorney General’s Office charged two men who were using the U.S. Postal Service to ship more than 35 pounds of the drug through Clearfield, Elk, Jefferson, Clarion, and Forest Counties. “Crystal meth trafficking is a growing problem in Pennsylvania, particularly in rural parts of our state,” Attorney General Josh Shapiro said at the time. Rural areas have long had higher rates of alcohol abuse, tobacco use, and methamphetamine use, according to the Rural Health Institute. Initially, the higher meth rates in sparsely populated areas were a result of how the drug was cooked — in covert labs, so the noxious fumes would not attract attention. The state attorney general’s Bureau of Narcotics Investigation has recovered just under 12,000 grams of meth this year. In some rural areas and small towns, a gram can sell for up to $80. 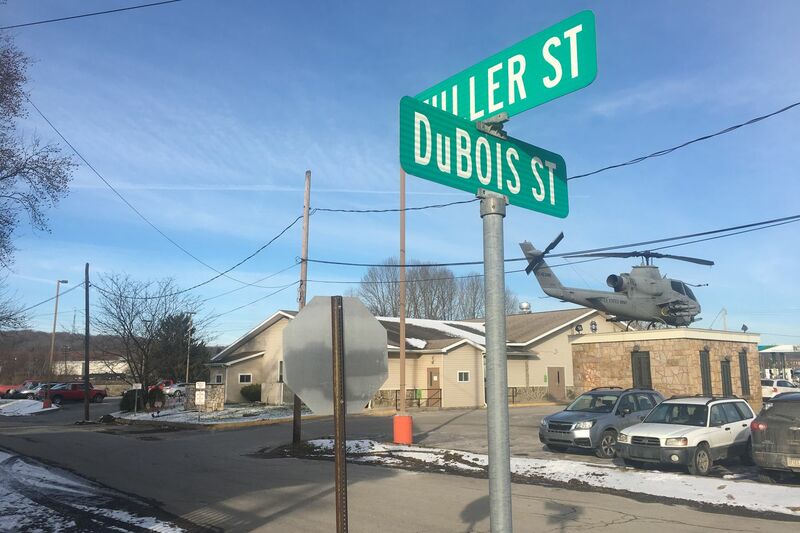 In DuBois, Police Chief Blaine Clark said his city has seen a 129 percent jump in drug reports from July 2017 to July 2018, most of them possession arrests. “It’s crazy. I’ve never seen something boom as quick as it did,” Clark said at the fund-raiser. Originally used in nasal decongestants and bronchial inhalers, methamphetamine is usually smoked in a crystalline form, thus the term “crystal meth,” according to the National Institute on Drug Abuse. The immediate short-term effects — increased heart rate, wakefulness, and decreased appetite — often draw users in, but the drug is highly addictive, and its long-term effects include insomnia and violent behavior. A Journal of the American Medical Association report released in October found that deaths from psychostimulants increased by 250 percent between 2008 and 2015 but have been “largely overshadowed by the opioid epidemic.” Clark and other law enforcement officers in Pennsylvania say it’s not a matter of one drug replacing the other. With more meth coming in from Mexico since 2010, and some made in portable “backpack labs” instead of the traditional, clandestine, rural meth labs, the drug is easy to obtain and often used as a holdover drug for people going through opioid withdrawal. These small “shake-and-bake” labs can often operate with an empty two-liter bottle, some household chemicals, and pills such as Sudafed. Those smaller labs are still dangerous. Berwick, about 110 miles northwest of Philadelphia, was long known for its storied high school football program. For several years, it was also known as “Methwick," Strish said. “Yes, our numbers were very intense for a community of 10,000," he said. DuBois Police Chief Blaine Clark dishes out spaghetti during a fund-raiser for fallen Officer Patrick Straub on Sunday, Dec. 9. In the last six years, 46 percent of Berwick’s drug arrests included meth. In the first 11 months of 2018, police arrested 86 people for heroin and 55 for meth possession. Three people were arrested for cocaine possession. Strish said officers have sometimes used naloxone to revive someone from an opioid overdose, only to find that person acting erratically and paranoid — a telltale sign of extended meth use. Meth has not taken the place of opioids in Pennsylvania’s more rural areas, Rather, both drugs have compounded the problem. “They go hand in hand. Many are literally making meth just to sell it and support their heroin habit,” Strish said. Strish said Berwick police teamed up with a county drug task force and put resources into dismantling meth operations there over recent years. In 2015, Berwick took down 12 meth labs. Last year, that number was two. In Pennsylvania, the Drug Enforcement Administration reported 5,456 drug-related overdose deaths last year, the majority from heroin, fentanyl, and prescription painkillers. A July 2017 report compiled by the DEA and the University of Pittsburgh found that methamphetamine overdoses, while low, had the largest increase from 2015 to 2016. Methamphetamines, according to that report, were present in 33 deaths in Philadelphia, followed by 20 in Schuylkill County and 17 in Bucks. The DEA’s 2017 National Drug Threat Assessment shows the South, Midwest and West continue to have the largest methamphetamine problems in the nation. I-80 runs nearly 2,900 miles across the United States, straight through Pennsylvania with stops in Berwick and DuBois. Both chiefs said the highway is easy access for dealers. An inspector with the Philadelphia Police Department’s narcotics unit did not return requests for comment. A month before Straub’s death, DuBois police arrested a Philadelphia man, William Patrick Donnelly, for meth possession. Police arrested Donnelly two months earlier there, too, and and charged him with intent to deliver. Clark said Donnelly traveled to and from Philly often. Clark said he knows it’s not “politically correct” but uses the words addict and junkie when he laments the ripple effect of meth reaching into schools, hospitals, and families. “You go into these houses, and there’s kids and, like, three or four meth heads laying around,” he said. Clark is angry, though. He had to spend a Sunday dishing out spaghetti to help raise money for the widow of a police officer he lost. Straub’s wife was too distraught to comment. Corey Alan Williams, 32, was driving the car that struck Officer Patrick Straub. Both men died in the crash.